Pakistan's current test team has achieved a lot since Misbah took over its reins in 2010. Likewise, its batsmen, particularly Younis Khan, Misbah Ul Haq, Azhar Ali, and Asad Shafiq have achieved a hell of a lot over this period - more than what any of their predecessors ever achieved. All these achievements have become a little bit sweeter with what Azhar and Asad have managed to do in Australia. Their feats have been remarkable. While Asad was the hero at the Gabba, Azhar owned the MCG! Azhar Ali's unbeaten 205 in the boxing day test at the MCG is the highest score by a Pakistani batsman in Australia in 33 years and earned him the honor of becoming the first ever batsman from Pakistan to hit a double century in Australia. Azhar Ali's 205* is only the fourth double century by a visiting opener in Australia and the third highest score by a visiting opener in Australia. Azhar Ali's 205* broke Virender Sehwag's record of the highest score recorded by a visiting opener at the MCG and earned him the honor of becoming the first ever visiting opener to hit a double century at the MCG. Azhar Ali is only the third opener ever in the history of test cricket to score a double century at this historical venue. The other two are Bill Lawry and Justin Langer. During his double century knock at the MCG, Azhar Ali completed 1,000 runs in test cricket in 2016. This first time he has achieved this feat since his debut in 2010. Azhar became only the 5th batsman from Pakistan to complete 1,000 runs in test cricket in a calendar year, after Mohammad Yousuf, Younis Khan, Inzamam Ul Haq, and Mohsin Khan. Azhar's tally of 1,155 is the third highest by a Pakistani batsman in a calendar year, and he has the opportunity to improve that to the second highest if Pakistan get a second innings crack at the MCG. Out of Azhar's 1,155 runs this year, 939 runs have come as an opener, which is the second highest tally by a Pakistan opener in tests in a calendar year. With 1,155 runs in tests in 2016, Azhar is the leading run scorer from Pakistan and sits at number 5 among the leading run scorers of the year. And look at that average! 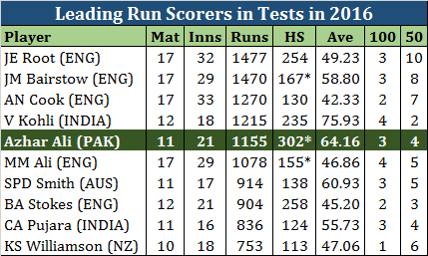 Second best among top 10 runs scorers of the year, behind only Virat Kohli. Azhar Ali has had a magnificent year in test cricket. A triple hundred and a double hundred in the same calendar year is rare, and he has become the first batsman from Pakistan to achieve this feat. He is just entering his peak years as a batsman and one can only imagine what more he can achieve going forward.